A version of this article originally appeared on The Progressive website. When I heard that my name was featured in a New York City Police Department report, I should have been outraged. I had followed revelations of NYPD spying, but it hadn’t occurred to me that they would come to New Orleans to watch me speak at a film festival. However, I also knew that the NYPD, in their crusade under the guise of safety, had gone whitewater rafting with college students and aggressively monitored and infiltrated mosques and Muslim businesses. They operate in at least 9 foreign countries, so why shouldn’t they come to New Orleans, listen to me say a few words at a public event, and write a classified report about it? Perhaps the only strange thing about the case is that I don’t fit their regular profile. As a white US citizen, I feel my case is a bit of an anomaly for a department that has developed a reputation for targeting immigrants and communities of color. My privilege has given me a certain amount of security and expectation of privacy that many others simply don’t experience. Recent revelations about NYPD abuses go beyond spying. The notorious stop-and-frisk program, which has led to the criminalization of virtually an entire generation of young men of color in the city, is one example. The New York Civil Liberties Union reported that more than 4 million stops and interrogations from 2004 through 2011 led to no evidence of any wrongdoing – about 90% of all stops. Other recent revelations about NYPD abuses have included arrest quotas, sexual assaults, and the harassment and arrest of an officer who had turned whistleblower. So my little brush with violation of privacy was just a small taste of what is possible from a police department that never met a boundary it didn’t want to cross. Step-by-step, we have seen any idea of privacy disappear – everything we do is the business of police. This has always been true for communities of color; now the scope has simply gotten wider. While law enforcement representatives defend the presence of officers filming at every protest around the country as harmless public safety measures, there is no doubt this has had a chilling effect on dissent. It is not just in New York that there is a divide in how people see – and experience - police. 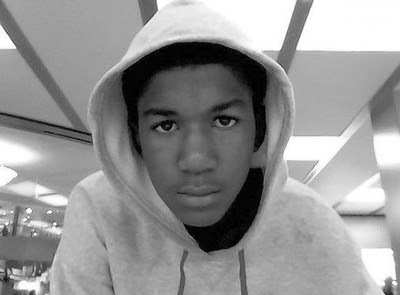 The national outrage over the killing of Trayvon Martin shows that his death – and the continued freedom of his killer – has struck a nerve among Black communities nationwide. Here in New Orleans, public outrage has been mounting over the abuses carried out by our own city’s police department. More than a dozen officers have faced charges for their involvement in the murder of unarmed civilians in the aftermath of Hurricane Katrina, most notoriously in the Danziger Bridge shootings. In that incident, two families fleeing the storm’s devastation were attacked under a hail of police gunfire that left four wounded and two dead, including Ronald Madison, a mentally challenged 40-year-old, and James Brissette, a sixteen-year-old who had been called nerdy and studious by friends. Most alarmingly, our local media, district attorney, and other systems of accountability mostly failed in their oversight – it was not until the US Justice Department became involved in 2009 that the officers faced charges. The next year, a Justice Department investigation of the NOPD found "reasonable cause to believe that patterns and practices of unconstitutional conduct and/or violations of federal law occurred in several areas." In the latest outrage, during the first week of March, two young Black men were killed by New Orleans police in separate incidents. One of the victims, Justin Sipp, was shot by officers during a traffic stop. The other youth, 20-year-old Wendell Allen, was shot in his own home by an officer executing a warrant. Allen was apparently unarmed and only partially dressed. Allen’s killer remains free, as does George Zimmerman, who killed Trayvon. This week, it was revealed that one of the officers who killed Sipp recently wrote a racist rant about Trayvon Martin on a news website, saying the young man deserved to die, and is now "in hell." I am disappointed that the NYPD choose to make me a target – however peripheral – of their spying. But I am truly angered by the role that police play in communities of color, at the criminalization of young Black children wearing a hooded sweatshirts. These latest revelations have had the effect of renewing my commitment to fighting for a system that knows that true safety and security comes from providing justice, liberation, and human rights for all; not in the harsh and violent justice of law enforcement. Images above from New Orleans monuments to white supremacy, recently spraypainted in support of Justin Sipp, Wendell Allen, and Trayvon Martin. 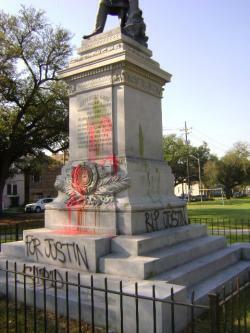 Last night three racist monuments were attacked: Robert E Lee, Jefferson Davis, and the White League statue. 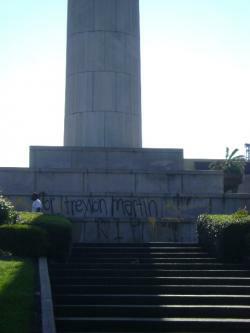 The monuments were graffitied, respectively, with "For Trayvon Martin," "For Justin Sipp," and "For Wendell Allen" and splashed with paint. We mourn these young mens' deaths and strike out in retaliation against the system that brought them about. The system that celebrates slave owners and racist lynch mobs is the same system that exonerates killer cops and racist vigilantes. 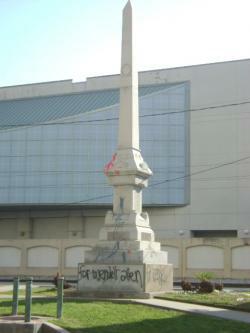 We want memorials to these fallen innocent youths, not to slave owners and racist mobs.